There are a myriad of palm species, such as Queen palms also known as Cocas palms, Royal palms, Bangalow Palms and the Golden Cane. They all have a similar roots system. Long fibrous roots that consist of many stringy intertwining strands. Palm stump roots are unique in their type because of their long fibrous nature. I have seen some palm stump roots responsible for the major movement of retaining walls and the cracking of pavers and concrete. 1 – By old fashioned physical exertion, the manual operation i.e. hoe, pickaxe or shovel which is basically a sharp edged tool which is swung with force to cut the fibers. This method is tediously slow and if you have the time and muscle quite capable of removing a palm stump. You can expect to spend many hours swinging the tool to break up the fibrous roots. One of the challenges with palm stump roots are their unforgiving fibrous nature. If you don’t use enough force the pickaxe or hoe will bounce off the roots. 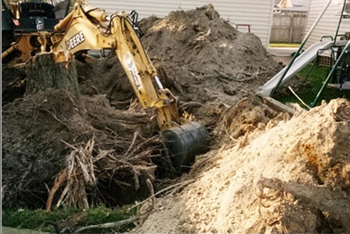 2 – An excavator will want to dig a huge hole in the ground (similar to a swimming pool) to be able to remove the stump. You will have a huge root ball which will a require a truck for transport to dump the tree stump at the dump. Take into account, excavator hourly rate, truck hourly rate and dump fees. Then there is the restoration of the site, to make good the area. 3 – Stump grinding. A stump grinding machine is a purpose built piece of machinery that grinds the tree stump to mulch and dust. The spinning cutting head has tungsten carbide teeth which make short work of wood. 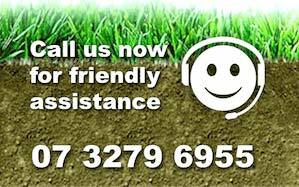 An experienced operator is able to work the machine in a efficient manner which takes care of the surrounding area and your property.